Over the last sixty years, Hollywood has introduced us to a myriad of alien migrants amiable (E.T.) and hostile (Independence Day), pacifistic (The Day The Earth Stood Still) and bloodthirsty (Independence Day), environmentally suppliant (The Day The Earth Stood Still – Keanu Reeves and Jaden Smith version) and environmentally destructive (Independence Day), passive (District 9) and predatory (Signs, Independence Day), but despite their many differences in appearance and intent, these races are usually united in their propensity to being gravely misunderstood (Super 8). Except, that is, for the aliens Steven Spielberg showed us so long ago in Close Encounters of the Third Kind, which we cannot effectively misunderstand because they defy all efforts at right understanding in the first place. As with the three-year-old boy central to this narrative, these visitors from the great beyond and the bright lights they trace upon the sky make precious little sense to our short-seeing minds, but they fascinate us all the same, filling us with wonder, fear, and hope successively in something like that order, or so they ought to if this underlying formula were really executed to the creator’s utmost capacity. 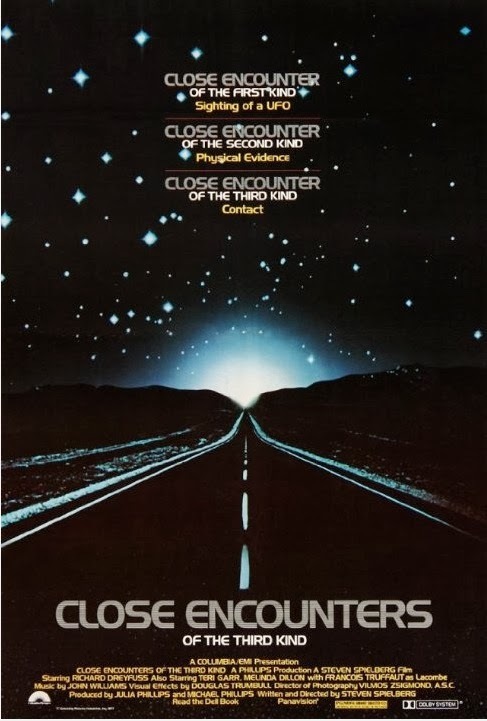 More so than Jaws, Jurassic Park, or even the Indiana Jones movies, Close Encounters may be the quintessential Spielberg thriller, being not only ridden with the director’s signature filmmaking tricks but also based on no work external to itself and the director’s own imagination. Incidentally, Spielberg’s unshared writing credit and absolute possession of the plot material are the biggest foible of Close Encounters; while he has sufficiently demonstrated a mastery of setting, shooting, and telling stories, he’s not all that much of a story writer, and when he does venture too far into that arena, his films become so artificially bloated with self-expressive family drama that their core appeal is lost amid laser-thin characters and groan-inducing dialogue. The second hero of this tale, played by Richard Dreyfuss of Jaws, is a somewhat more ordinary guy named Ron, father to three kids who bitterly rebut his offers to show them G-rated Disney movies and husband to a constantly exasperated wife Ronny. She herself looks too similar to another blond mother raising the aforementioned three-year-old, who innocently interprets the visitors’ bright lights and noises as an invitation to play and who isn’t actually prescribed a name until he’s whisked up into the neon-painted sky by a… tractor beam or something – we don’t actually see it happen. “BARRY!” mom vainly cries as the deceivingly beautiful fires blazing on the sky dwindle to a minute glow. Not to worry, though, as Spielberg children are only seldom subjected to any real danger and not a single person in this movie is killed by the ‘friendly aliens’. That’s it for character development, outside of some family quarrels ensuing from Ron’s impending madness that climax in screaming bouts, slamming doors, and other gestures of fury that then-bachelor Spielberg presumably thought were typical of marriage and family life. Observe the scene wherein the husband locks himself in the bathroom so that he might tremble fully clothed in the basin and seriously frighten his wife, who forcefully pulls him out, yells about his bull**** at the top of her lungs, and proceeds to lock herself in the bathroom after removing him thence. Fortunately it’s not this incident that ultimately separates the two but one occurring later in which the pater familias uproots all the plants around his house and hurls them blindly into the kitchen. His motive: to construct a larger model of a towering monument that hounds his conscience wherever he looks, in random mounds of dirt, in meals, and in his shaving cream of all things. “This means something. This is important,” he repeatedly insists with teary eyes, never bothering to explain just why it’s important because the writer probably doesn’t know himself any more than he understands how to write a natural conversation. Perhaps the aliens are supposed to symbolize God in all His mystery, might, and magnitude, and the final ascent to the summit of Devil’s Tower shrouded in fog might bear out this hypothesis to some degree, but more than anything they’re just an excuse for Spielberg to exercise his all too familiar cinematic trademarks, including a fixation with what the actors, not the viewers, are beholding, a penchant for revealing the monster in teasing glimpses, and a long buildup to a truly bombastic finale. And what a protracted finale it is, laboriously showing us the disembarkment of not one, not two, not three, but four waves of silhouetted passengers from the gigantic mothership, and only doing so after the scientists incessantly barrage the smaller saucers with the same 5-note John Williams song, parrot another John Williams song as it’s vaunted from the larger saucer, and don their protective sunglasses to shield themselves from whatever horrors walk down the gangplank. However long James Cameron managed to draw out the last act of Aliens, the ending of Close Encounters feels even longer still and unfortunately fails to fulfill the expectations it has set up for itself; by the time we finally observe the aliens in the flesh, we have built such anticipation from the cinematography, suspense, and wide-eyed stares of young actor Cary Guffey that the actual beings don’t leave nearly as strong an impression as they ought. The xenomorph queen in Cameron’s picture was really a kind of twist addition to the Alien mythology, whose unforetold introduction late in the reel made her impact on audiences all the more powerful, but Spielberg composes his whole story in such a way that the end revelation is constantly weighing upon the viewer’s mind, inevitably falling short of the thing he’s come to expect. The whole of Close Encounters is certainly smaller than the greatest of its parts, which are on occasion brilliantly and mesmerizingly scary, kind of like that otherworldly, smoky-eyed prophetess in the Lindsey Stirling Stars Align video (for the love of, well, you, please don’t make another video so glittery and glammy and green-screeny as that). The best parts, however, aren’t those in which we see the full extent of the alien vessels, racing down highways with human cops in close pursuit, but those in which Spielberg only hints at their form and allows the viewer to fill in the rest of the details. One scene particularly exemplifies this method wherein a character is parked at an empty crossing in the middle of the night, reading a map spread in front of his dashboard. As the camera stares back at his rear window, the solitude of the man’s situation is disturbed by a set of approaching lights, somehow unlike the pair that drove up behind him earlier. Looking out his window, the driver sees a row of mailboxes rattling violently on the roadside, but the assailant affords him little time to react, for a blinding circle of white light overturns the gravity of his vehicle interior mere seconds latter, throwing everything around him into disarray. Another notable instance of Spielberg’s technique occurs later at the pastoral household of little “Barry” and his mother, where the heavens are darkening in a mass of swiftly rolling storm clouds and bright shades of pink or blue are converging on their delicate shelter. Frantically the mistress rushes to shutter all the windows and doors but she has far underestimated the intelligence of her foe, which moves thereupon to enter through the chimney shaft, to terrorize them through possession of their kitchen appliances, and even to rise from the floor by unscrewing an uncovered grate. The scene is awe-inspiring not just in its use of lighting and sound but also in the gorgeous yet foreboding cloud formations that overhang the embroiled family, something I don’t recall seeing incorporated nearly as well in any film except Oblivion and Prometheus. Would that the rest of Close Encounters measured up to these fleeting moments of greatness. In evaluating any current effects-heavy film, one must always contemplate whether its story is strong enough to endure even after thirty years of technological advancements leave its visuals in the dust of obsolescence. If the story is such, then the film should have just as much appeal among future generations as it does among its own. If the story is not so meaningful, then the film is consequently fated to unravel and rot with age, passing into extinction along with the spectacular imagery that once propelled it to success. For all its significance in pop-culture, Close Encounters sadly falls more among the latter group, plucking an absurd sci-fi yarn fresh from the grapevines of Coast To Coast that’s slightly more spiritual than the completely soulless Super 8, vastly more subtle than the insipidly preachy Signs, and just as forgettable and sentimental as both. Unlike either of the newer flicks it inspired, it doesn’t offer any half-baked, ludicrous explanations of the extraterrestrial species that left me feeling unsatisfied or insulted (SIGNS SPOILER – SKIP TO END SPOILER IF YOU HAVEN’T SEEN IT YET: If the invaders are really vulnerable to H2O, why on earth did they come to harvest the inhabitants of a planet where 70% of the surface area is covered in that toxin? END SPOILER), but its aliens remain so uninteresting and purposeless that they now persist more for reasons of camp and nostalgia than for any particularly profound experience or emotion they spark in us. This does not mean anything. This is not important. This is not very well written. Apology: I regret to inform everyone that the original printing of this review at 10:00 AM Tuesday did not include a requisite Lindsey shout-out. Forgive me for allowing my mind to momentarily lapse from the rightful object of its devotion. As of 8:00 PM I have emended this oversight upon the recommendation of my closest peers, whose input literally saves my life over and over… or something like that. I haven't seen signs yet but your spoiler on that does make sense. I think that the sound was a stupid time-filler.